These words adorn a bronze plaque in downtown Seattle, on the side of the flagship Nordstrom store. 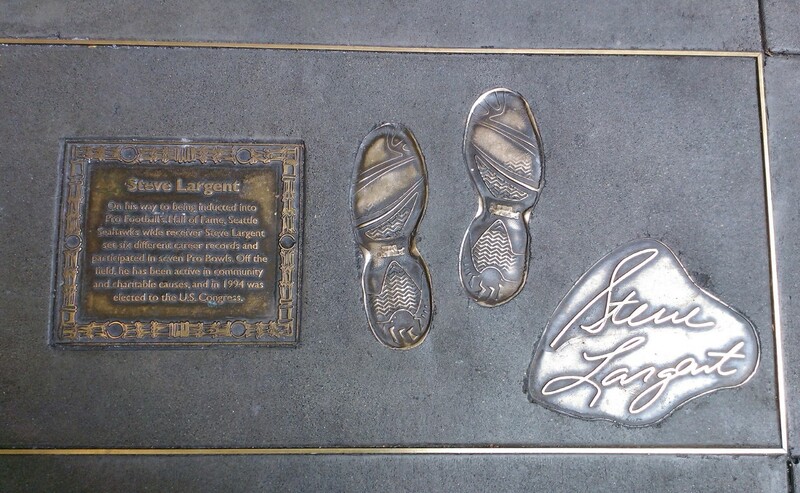 Growing up in the area, I’ve passed it many times, as well as the footprints of these “giant strides” from iconic Seattle entrepreneurs, politicians and artists – many of whom, like Olympian Apolo Ohno and baseball star Ken Griffey Jr., are pretty well known to people outside the Pacific Northwest. But as someone who has lived in Seattle for nearly my entire life (minus 7 years or so), there were some hometown heroes that even I hadn’t heard of! Gwendolyn Knight and Jacob Lawrence: Although Knight and Lawrence were born in Barbados and New Jersey (respectively), the married couple spent the later years of their careers in Seattle. Lawrence was already an established artist of the Harlem Renaissance when the couple, who had been married nearly 30 years at this point, moved to the Pacific Northwest in 1970. Lawrence was invited to be an art professor at the University of Washington, where many of his paintings are still displayed today. Knight painted her entire life, but did not start exhibiting her work until she was moved to Seattle. Her first show, Never Late for Heaven: the Art of Gwen Knight, opened at the Tacoma Art Museum. Today, art by both Lawrence and Knight can be found all around Seattle, including UW’s Meany Hall for Performing Arts and the Paul G. Allen Center for Computer Science & Engineering, as well as the State of Washington History Museum. The duo founded the Jacob and Gwendolyn Knight Lawrence Foundation in 2000 to support emerging artists. Mary Maxwell Gates: Everyone has heard of Bill Gates, but not many people know that his mother also made a lasting impact on the world of Seattle nonprofits. Gates was born in Seattle and studied education at the University of Washington. She taught school until her husband launched his law firm, then turned to volunteering and philanthropy within her community. Gates served on the board of many local organizations, including the Greater Seattle Chamber of Commerce, the Seattle Symphony, the Junior League of Seattle, the Children’s Hospital Foundation, as well as becoming the first female president of King County’s United Way and the first female on the board member at the First Interstate Bank of Washington. Gates served on the University of Washington’s Board of Regents, the Foundation’s Board of Directors, the Medical Center Board and the School of Business Administration’s Advisory Board. Today, there are 2 endowments in her name at UW, and Mary Gates Hall is named in her honor. Father William J. Sullivan: Sullivan was ordained as a Jesuit priest, and received a doctorate of religious studies from Yale Divinity School. He worked at Saint Louis University and Marquette before moving to Seattle and becoming provost of Seattle University in 1975. The university had declining revenue and a shabby campus before Sullivan stepped in and made some drastic changes. During his presidency from 1976 to 1996, Seattle University acquired a law school from the University of Puget Sound, and built several new buildings, including the Chapel of St. Ignatius. 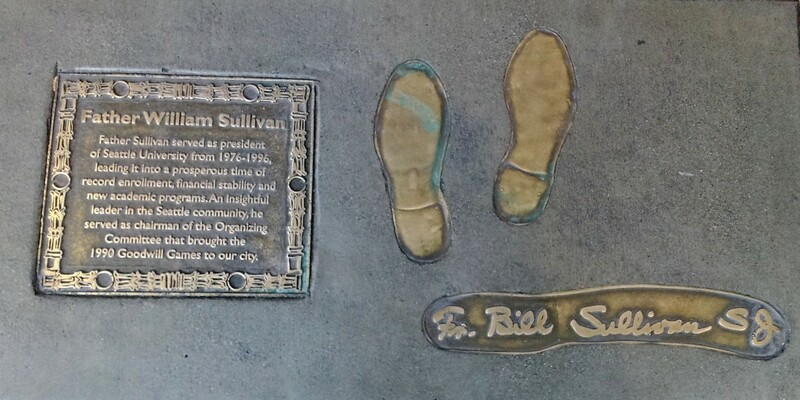 Sullivan was the chairman of the organizing committee for the international Goodwill Games, which Seattle hosted in 1990. After retiring from the Seattle University presidency in 1996, Sullivan remained the school’s chancellor for an additional 13 years. Today, the Sullivan Leadership Award is offered to 9 incoming freshmen every year. Eddie Carlson: A native of Tacoma, Carlson first entered the hotel industry as a pageboy while attending the University of Washington. 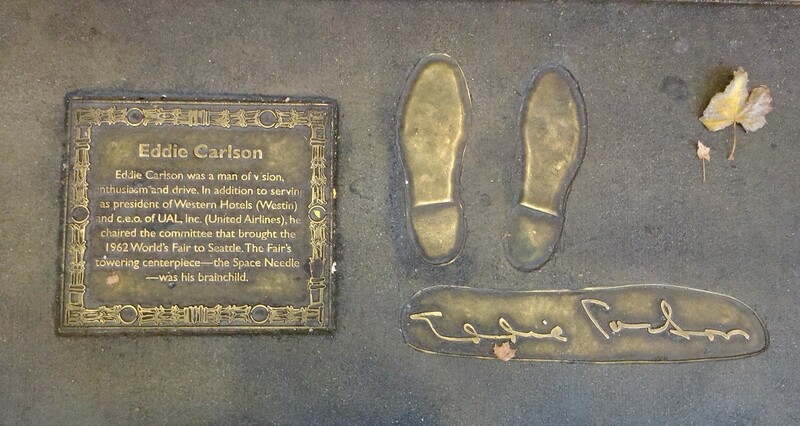 Although he never finished his degree, Carlson worked in Seattle as a hotel elevator operator, bellhop, room clerk, assistant manager and manager before he joined the US Navy at the age of 31. When Carlson returned from World War II, he took a job as assistant to the president of Western Hotels (now known as Westin Hotels). Carlson then worked his way up through the ranks: he became executive Vice President, President, then Chairman and CEO. When the hotels merged with United Airlines in 1970, Carlson was able to turn the nearly-bankrupt airline into a thriving business once more. Today, he is remembered for bringing the 1962 World’s Fair to Seattle, and is credited as the origin of the idea of the Space Needle – one of Seattle’s most iconic landmarks. After his death, the Carlson family established the Carlson Leadership and Public Service Center at the University of Washington. Steve Largent: Largent’s claim to Seattle fame began when he was traded to the Seattle Seahawks as a wide receiver in 1977, where he remained for 13 years. Over the course of his NFL career, Largent was selected to play the Pro Bowl seven times (the first Seahawks player to earn that honor), and held all major NFL receiving records at the time of his retirement, including the most career receptions, the most touchdown receptions and the first receiver in NFL history to achieve 100 touchdown receptions in a career. Largent was inducted into the Pro Football Hall of Fame in 1995 (the first year he was eligible) and Seahawks jersey #80 was retired in his honor. Today, the Steve Largent Award is presented annually to the Seahawks player who best exemplifies the spirit, dedication and integrity that Largent is known for. This entry was posted in The Seattle Scene and tagged Apolo Anton Ohno, Eddie Carlson, Gwendolyn Knight, Jacob Lawrence, Ken Griffey Jr., Mary Maxwell Gates, NFL, Pro Football Hall of Fame, Seattle Seahawks, Seattle University, Space Needle, Sr., Steve Largent, Tacoma Art Museum, United Airlines, University of Washington, Westin Hotels, William Sullivan, World's Fair. Bookmark the permalink.